This investment course will teach you how to make $100/day and more. By "more" I mean you can double your money in a week or in a few months depending on the market! We have seen up to 8000% returns on investment! Wow! I know that sounds crazy but that is what is happening in the crypto world RIGHT NOW! If you wait any longer you will miss out! You will get my investment strategies that you can use over and over again. 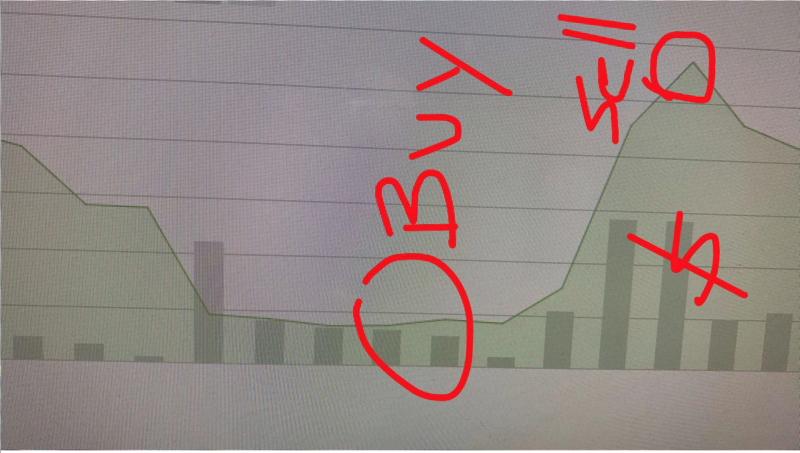 You also get my buying and selling signals! These are alerts via facebook messenger! I have made some pretty good calls! Within a day you can get 20%-40% return on investment! In a week you can get 100%! It depends what is happening in the market. 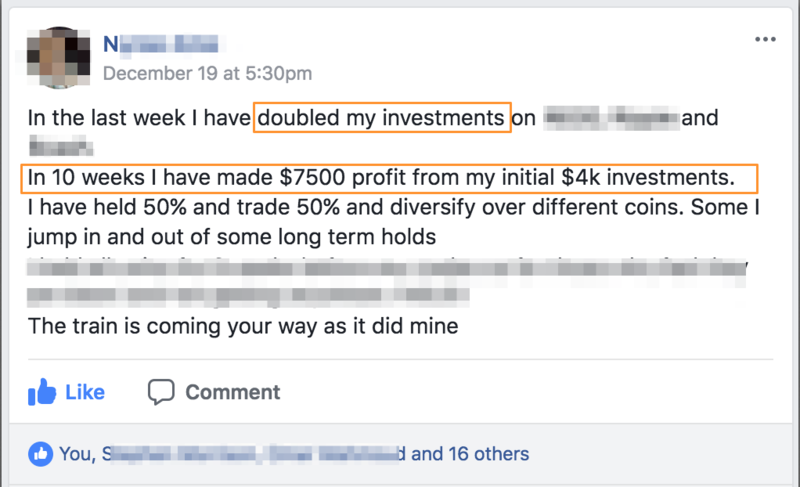 That means if you invest $1,000 then you get $1,400 in a day! (not every day! But when things are moving fast you can make even more than that! You learn how the big guys do it! You don't give your money to anyone, I show you where the big millionaires invest their money! This course is how to do everything from scratch yourself! 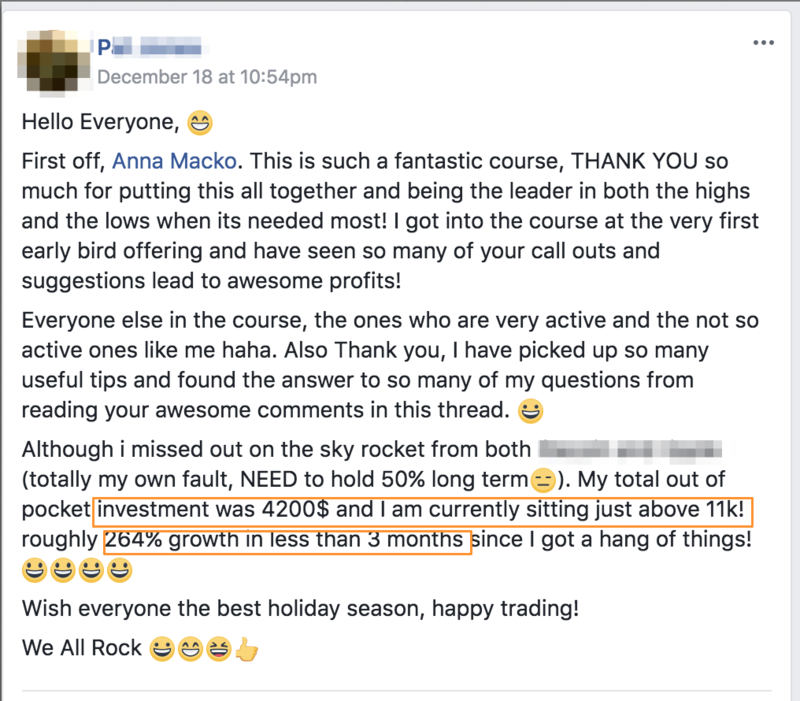 Here is a recent example of a member making 1000% return on investment in only a short month! 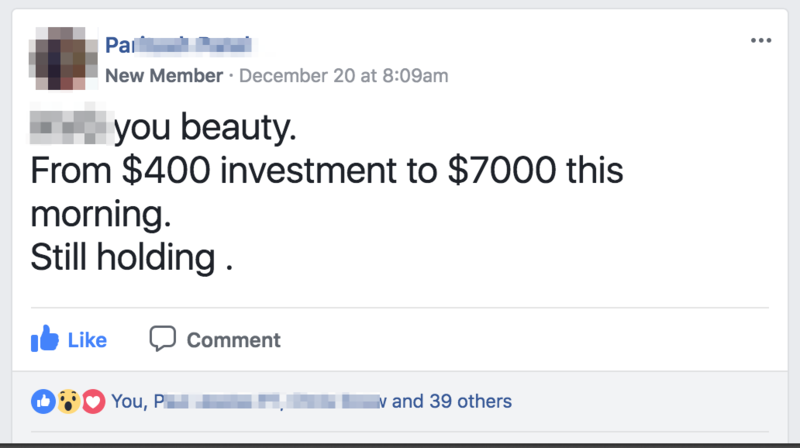 That is 10x your investment! If you put in $100 you get $1000! if you put in $10,000 you get $100,000! This is happening inside my course! 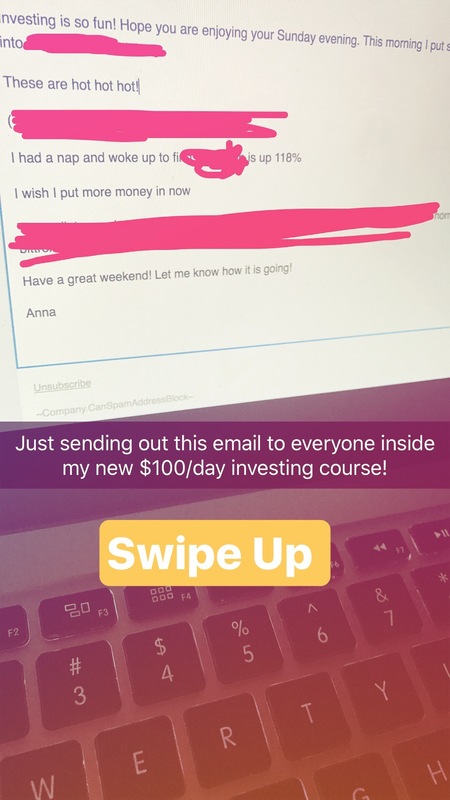 Anna Macko's investment course is for beginners, and for those that want to invest their money but are not sure where to start. Q. Does this work for me in the UK, Canada, USA, Australiam Iran, India... all over the world? Q.How much money do I need to invest? A.I spend no more than 5 minutes a day - Some days I do nothing and hold my investment for a week - A trade (buy or sell) takes me 5 seconds to actually do a trade! This is me actually working from my rooftop pool! I turned $20,000 into over $80,000 in less than 3 months! At first I was just holding long term because it will go up but then started trading and found it is a faster way to make money with this! A. Low - its like when real estate crashed, if you don’t sell, it will go back up! It goes up and down all the time. Very volatile which means it is PERFECT for trading as you can make money every day! (The good thing is you don't need a HUGE capital like you do in real estate and the return on investment is way better here! In real estate you are lucky if you make 13% a year return on your investment AND you have to wait 5 years at LEAST! 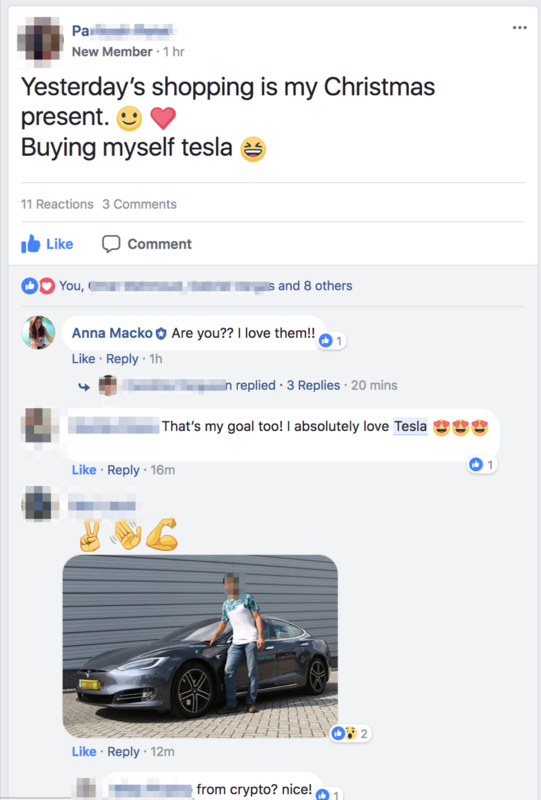 In this you can make 110% in a day! YES A DAY!!!! Look is this risky? I don't think so because the thing is, there will be dips there were 140 BIG dips since I have been studying this. By BIG I mean 40%, and people panic every time and thing its the end. Then the market recovers more than what it was at the last highest spike. I always buy more in the dips. 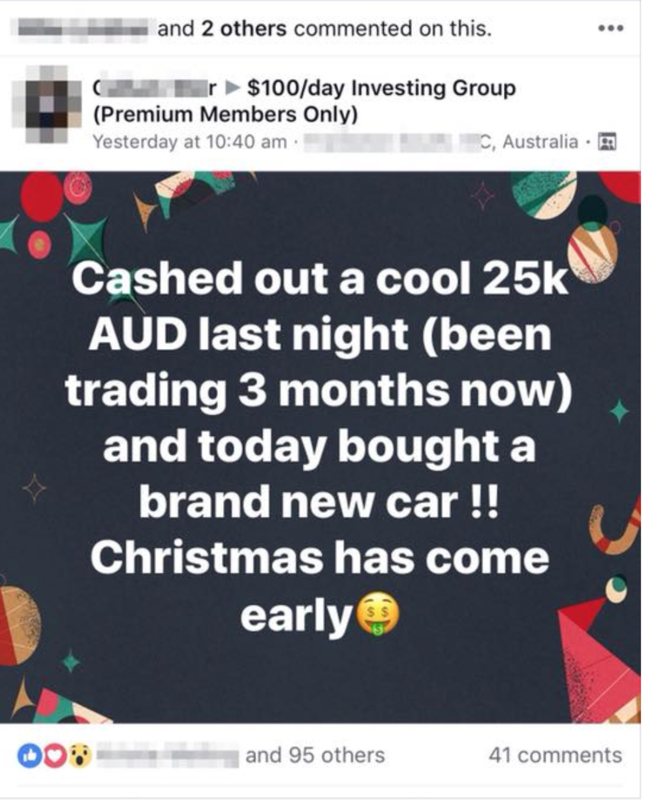 People panic and I buy more! You can't lose if you don't sell lower than what you bought it for. If you just hold on and wait, you won't lose your money. Q. How long do you think this will go on for? Is this a bubble? So No this is not a bubble, let me quote Churchill for you - “this is not the end, it is not even the beginning of the end; it is more like the end of the beginning”. Nothing goes straight up, unless it is a bubble about to terminally burst. It is perfectly normal to have declines, even long and sustained ones, that serve to transfer ownership from weak to strong hands. Weak hands are defined as marginal buyers who are ready to jump out at the slightest whiff of a decline. They tend to get separated from their money rather quickly. Q. Do I need a high power computer? I already spent hours, months researching this and practicing. I have made the course so simple so you can just follow me. The buy in part is just a matter of typing your buy price in a box. The withdraw part is a matter of withdrawing back to your bank account. Here is an example of emails I send! When my recommendations go up I literally do backflips in the pool! A. Between 0.0022 and 0.008 (the more you trade the smaller the fees get) I have a special worksheet that you will get in the course so you can calculate if the trade is profitable or not with the fees and tax. Q. What is the tax? There is also a way to get around paying the tax so you can re-invest that money. Check with your accountant but when you sell an investment and buy another then you can defer the tax until a later date! Listen to what some students are saying! One-time payment and no further investment is required. Stop trying to waste time learning all this yourself. JOIN MY PROGRAM and be mentored by someone who is already doing this! Learn step by step how to invest your money and gain $100/day at least and make money like I do - The best time to plant a tree was 10 years ago, the second best time is now. Start investing for your future now. If you have any problems please email me directly at: anna@annamacko.com or Snapchat 'lovingnotworkin'. I answer all questions from my members. This investment course already has a value of over $25,500! When you start making $100 a day, it will only take you 10 days to get back your return on investment. Less than the price of a new iPhone x! Wait to buy the iPhone, make money first, and join me in the $100/day investment course. from A to Z course for everyone who wants to learn how to research cryptocurrency projects, how to invest safely and how to profit wisely from them. Everything is explained in great details and most important its explained in easy and understandable way. The course is giving me the confidence and hope I need to invest in cryptocurrency. The only thing I can say is that I would like access to the private Facebook group and I am still waiting for Anna or someone on her team to write back to me with further questions I have since I paid for this. 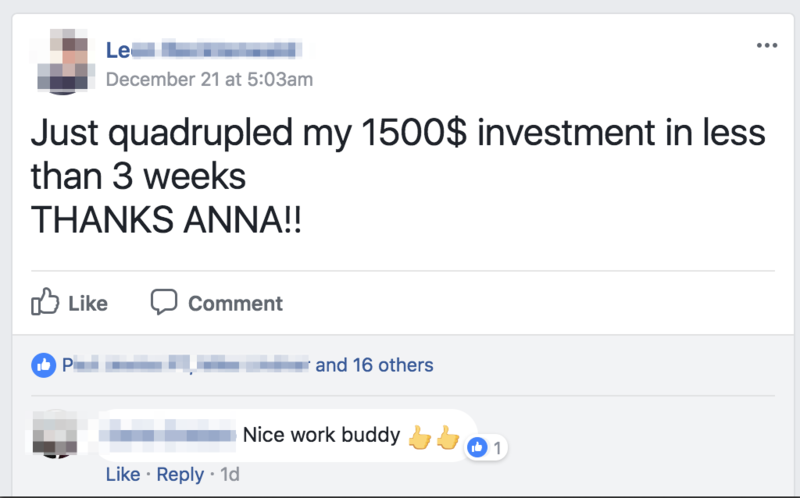 I wish to be a part of the networking community Anna is offering. The course is simple, accessible and I cannot wait to update and do a possible testimonial for Anna Macko. This course changed my entire perspective on cryptocurrency and I quadrupled my investments! would definitely recommend to everyone! Thank you! Awesome and full of really great information! I learned so much going through this course and i loved it! I can't wait till I start earning more and more money. Thank you so much! I really want to join the Facebook group but i am having trouble finding it. This course has changed my life! I am so glad I have come across Anna Macko's instagram account and decided to do this course. It has definitely opened my eyes to a whole new world of opportunity. Anna puts things simply...which is awesome for people like me who knew nothing about this topic (I only knew about Bitcoins). It's very refreshing because all these blogs, videos, articles, etc, on the internet talk in a language I can hardly understand, and this makes me even more confused! Anna explains things well and the course is very easy to follow and understand. 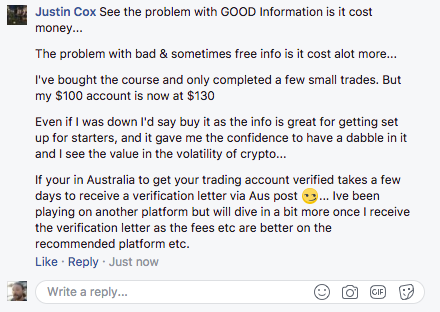 I am grateful I took the opportunity and very optimistic about my future due to this course and the Facebook group I am now a part of where I am learning a lot of information. Thank you Anna!!! :) Many blessings to you beautiful soul. I thought this would be more complicated than it was, and although there is still much to learn, this has given me the confidence to now learn more through actual trading experience. I am so happy that I took the step to purchase this course. Very informative and when I thought I had questions, I just kept reading & watching the videos & the answers came to fruition. I am very eager to get started & grateful that Anna took the time out to share all of this info with everyone who participates in the course. $!$!$!$! Anna knocks it out of the park again with this course. I've learned as an absolutely beginner how to trade and invest in cryptocurrencies from a person who has skin in the game and has had replicated success in this arena. 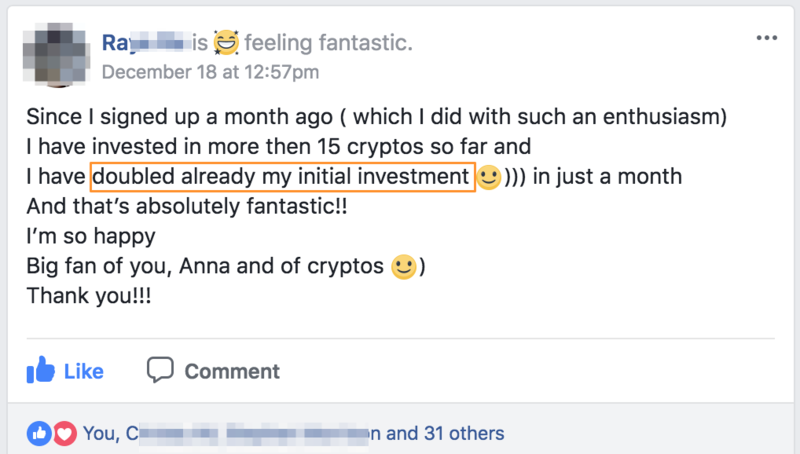 Thank you Anna for this wonderful course and making everything from ideas, set ups, research, trading strategies, suggestions, security, and mindset crystal clear for those who want to make fun / serious money with cryptocurrencies. YOU CAN LEARN HOW TO INVEST LIKE A BOSS. Earnings Disclaimers: We don't believe in get rich quick programs - only in hard work, adding value and serving others. Our programs are intended to provide information and to make a difference in the world. As stipulated by law, we can not and do not make any guarantees about your ability to get results or earn any money with our ideas, information, tools or strategies. After all, it takes hard work to succeed in any type of business. In fact, it takes hard work to succeed at ANYTHING in life - try learning to play the guitar without putting in any work, and see how that goes! Your results in life are up to you and the amount of effort and resources that you are willing to put into succeeding. We just want to help by giving great content, direction and strategies that move you forward. Nothing on this page or any of our websites is a promise or guarantee of results or future earnings, and we do not offer any legal, medical, tax or other professional advice. Any financial numbers referenced here, or on any of our sites, are simply estimates or projections, and should not be considered exact, actual or as a promise of potential earnings—all numbers are illustrative only. Please take note if you are trading cryptocurrencies: Trading currencies (or any other financial market) involves substantial risk, and there is always the potential for loss. This is not advice of any kind, all content in this answer is for informational purposes only. Remember when reading my topics about trading we only give you advice based on research and market analysis. Please only use this as a guide and do not hold us responsible for any losses. This course should not be taken as, and is not intended to provide, investment advice. Please conduct your own thorough research before investing in any cryptocurrency. When you complete your payment, even on the payment plan, you instantly get access to the full course. For this reasons there are no refunds. You will get plenty of guidances and assistance along the way. For the sake of the law, lifetime coaching means two years. The program will stay open as long as possible. You will also be added to a fun support group where you will meet other members in this space within a few days of joining the class. Thanks for stopping by. © 2018–Current The Internet Life Academy / Loving Not Working All Rights Reserved.